Roading construction workers make surfaces such as roads, airport runways and driveways, and control traffic around road construction sites. Chances of getting a job as a roading construction worker are good due a shortage of workers. Pay for roading construction workers varies depending on their experience, responsibility, and the location and type of work. Roading construction workers usually earn between minimum wage and $24 an hour. Roading leading hands and forepeople may earn $40,000 to $85,000 a year. Specialist machine operators and roading team leaders may earn more than this. Sources: careers.govt.nz research, 2018; and FY 18/19 Hays Salary Guide, 2018.
control traffic moving around their construction site. Roading construction workers usually learn skills on the job. work in most weather conditions and in places that may be noisy, wet, cold, dirty and dusty. Gloria: I’m Gloria Blake, I’m 16, I go to Penrose High School in Auckland. I want to look into a job that’s heavily male-orientated for that bit of… kapow! Clinton: You might think we’re taking Gloria on a surfing holiday, but this will be no holiday. For we’ve come to Raglan to mend roads. New Zealand has a very extensive network of rural roads and keeping them in good order is no small job. Gloria’s mentor is Don Stevens. Don: There’ll be no time for surfing this morning. Because we’ve got plenty of work to do. Clinton: Don is road maintenance supervisor for Tanlaw, the Waikato’s road maintenance company. Tanlaw have to systematically inspect every road, sealed and unsealed, in their area. When faults are found the position is marked and the detail logged. Don: When we’re out there – it’s hard work. There’s a lot of sweat and tears that goes into providing a good surface for our clients. It’s dusty out there, you’re out in the weather, in the rain and the sun. It requires a person that is pretty hardy. Clinton: First job – marking up a high shoulder – a section where grass is preventing good drainage. Don: You’ll be fine – girl power! The type of people that you need in the construction industry – maintenance and construction – are people that are reliable for a start, have good work ethics, people that are self-driven. We're looking for people that enjoy the outdoors, the physical side of things, have certain skills. Licences are a big plus within our industry. Very good! That’s our high shoulder marked up. Now all we have to do is load it in the PDA. Clinton: GPS tells them where they are and the PDA is used to record all faults. The faults could be drainage problems, pot hole problems, or shiny surface problems. Fixing faults in public car parks are part of the job too. Don: As you can see down here, Gloria, the car park area here’s started to break up. The metal’s unravelling and it needs to be strengthened. So we’ll bring in a hoe, and a stabilisation gang, and they’ll fix this. Clinton: First water, and then cement is laid on the surface. Don: Dealing with certain chemicals, cements, limes, you have to be trained to know how to use them properly because safety’s paramount. Clinton: The hoe then churns up the existing road materials and blends them with the cement. It’s like mixing one giant rock cake. Don: Yeah, you won’t break anything, this is a man’s toy! Clinton: There’s no shortage of toys on this job. Each machine is designed for a specific task, which means each driver requires specialised training. Don: Just today, we’ve brought out our newest, most shiny truck. So what they’ve done, they’ve sprayed on an emulsion, a 180-200 emulsion mixed with kerosene, and then they’ve come in with the trucks and spread a layer of grade three chip, and they’ll go and spray again, and apply a grade five chip, which is a smaller chip. Then you’ll be able to jump on the roller, and give it a good pounding! Gloria: It was fun! And it was coooool! Clinton: At this site, there’s been a very big slip. Thousands of tonnes of fill are being tipped to provide a wider and safer roadway. Brock Orbell, currently in his third year of apprenticeship, is one of the team here. Gloria: So I think you really enjoy doing this? Brock: Yeah, I do enjoy doing it. I never thought I’d do it, I joined the work force here and didn’t know anything about it, didn’t know how to drive trucks or rollers or diggers. So I can do all that now, So yeah it’s been a good learning curve. Clinton: Brock intends to train for another five years, in order to advance his qualifications. Brock: I know it’s a hell of a long time to do an apprenticeship for, but, you know, at the end of the day, sitting in an office and earning a lot of money – pretty choice! Clinton: Well another load of fill’s arrived, and someone’s got to shift it. Don : Right hand forward and down. [to Gloria] And swing around quietly. Don: And place that metal out. Don: I think for the amount of time she had to practise, she was amazing. She’s got plenty of potential there, she picked up what I told her very quick. She’d be a great digger operator. Gloria: The machinery was fun. Like they always say boys and their toys. What about girls and their toys? That was fun! Don: yes she cottons on to things really fast, she listens, I think she’d be a great team player, I think we’d have no problem hiring her in the future and I think she’d be a great team prospect. Clinton: To enter the civil construction industry, you can train on the job with the aim of achieving national certificate qualifications [now New Zealand Certificates]. For school leavers there are modern apprenticeships [now New Zealand apprenticeships] and cadetships available in the industry. Infratrain [now Connexsis] also offers senior school students the Gateway programme which provides an opportunity for hands-on workplace learning in the civil construction industry while still at school. The job outlook for roading construction workers is excellent as the number of people employed is expected to increase. to pass pre-employment medical and drug tests, and a police check. Heavy vehicle licences (Classes 2, 3, 4 and 5), and R, T or W (rollers, tracks or wheels) endorsements are an advantage. Roading construction workers gain skills on the job. Most start as labourers and move into more specialised roles as they gain skills and qualifications. A minimum of three years of secondary education is recommended. Useful subjects include English, maths, science, construction and mechanical technologies and physical education. For Year 11 to 13 students, the Gateway programme is a good way to gain industry experience. These programmes may help you gain an apprenticeship, but do not reduce the amount of time it takes to complete it. Roading construction workers need to have excellent fitness and health and must be strong, as the work can be physically demanding. national and local government plans to spend over $5 billion on transport each year until 2028, with a focus on building and maintaining safer roads, walkways and cycleways. high staff turnover – as roading construction workers are in demand, they can easily change employer for better conditions. Job opportunities for roading construction workers are best in spring and early summer, when most roading work is done. 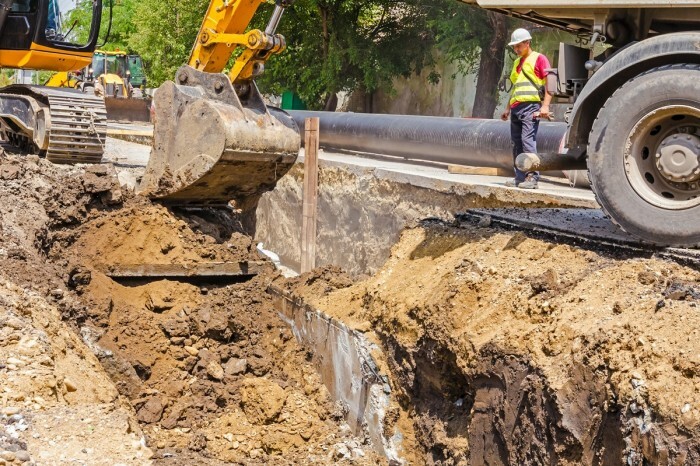 Roading construction companies often prefer to employ roading construction workers on a temporary basis to start with. Although these are usually short-term contract positions, they're likely to lead to more permanent work if you're suited to the role. Most roading construction workers are employed by construction or roading companies. About 30 large companies do 90% of the roading work in New Zealand. Ministry of Transport, 'Government Policy Statement on Land Transport 2018/19 – 2027/28', June 2018, (www.transport.govt.nz). New Zealand Transport Agency, 'Transmission Gully', accessed July 2018, (www.nzta.govt.nz). Roading construction workers may progress to become earthmoving machinery operators or drainlayers after further training. They may also move into team leader or management roles.